"We just started building statistical excel spreadsheets for our direct mail and online marketing campaigns, I purchased Excel Statistical Master to help fill in some of the blanks. Little did I know, this book has everything I could ever want to know about business statistics. Easy to follow and written so even a child could understand some of the most complex statistical theories. Thanks Mark!" 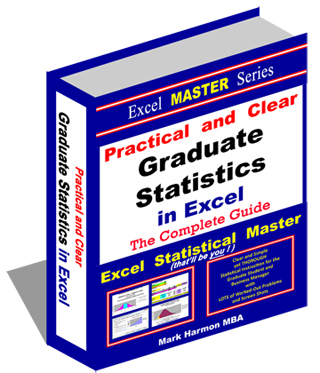 "After years of searching for a simplified statistics book, I found the Excel Statistical Master. Unlike the indecipherable jargon in the countless books I have wasted money on, the language in this book is plain and easy to understand. This is the best $40 I have ever spent. " "I really like the Excel Statistical Master. It is incredibly useful. The explanations and videos in the manual are excellent. It has really made my work with statistics a LOT easier. I'm really glad that I came across the manual. If you're a student of business statistics, this e-manual is worth WAY more it's priced. I will use your manual as a reference for my MBA course this summer." Taguchi Testing - What Is It and Is It a Good For Landing Page Optimization? Is SPC Limited By The Central Limit Theorem? Top 10 SEO Excel Functions - You'll Like These! Pivot Tables - One Easy Step That Will Double the Effectiveness of All of Your Pivot Tables!